In work, warfare and spirituality, elephants played important roles in ancient Ayutthaya. The Royal Elephant Kraal was moved to its current location in the 16th century and used for elephant roundups as late as 1905. Restored in 2007, it’s now a centre for the care, breeding and training of more than 90 elephants. Visitors can stop by for a quick visit or hang around for the Elephant Stay programme. Occupying both banks of the Lopburi River in the rural northern reaches of town, the actual Kraal covers a large piece of land ringed by an immense wall with huge wooden supports and a long roofed structure for the mahouts. It was used for corralling the elephants after a roundup so that the king and his generals could assess the latest group. Today the elephants are usually kept in a few different stables behind the Kraal. 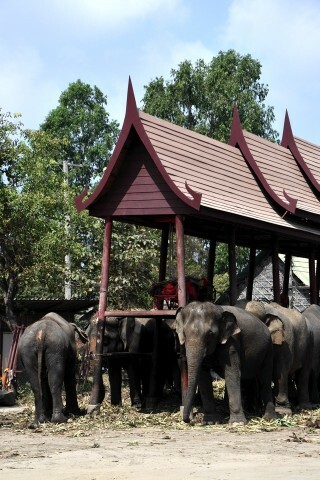 A team of mahouts trains them to pose for photos and provide rides in the Historical Park, where the animals don traditional red-and-gold attire while carrying tourists around the ruins. Reachable from the Kraal by a footbridge, a veterinary centre cares for old and sick elephants. Rides and shows are not offered at the Royal Elephant Kraal itself, though visitors can pay 50 baht to take photos while on a short visit. Those looking for a more in-depth experience can spend two or more nights staying at the Kraal’s simple accommodation while being assigned to bathe, feed and otherwise care for a single elephant each day. There’s also time to swim with the animals, and those opting for a longer stay can receive mahout training. Is the Royal Elephant Kraal an ethical choice for an elephant experience? It’s run by a non-profit and is certainly better than the for-profit elephant camps found in Phuket or Pattaya. However some experts believe that it’s cruel to ride an elephant on any place except the neck, and one of the Kraal’s major objectives is to train the elephants for tourist rides. In 2013, an elephant from the Kraal stomped a tourist to death after she tried to feed it. The Kraal claims that the rides provide good exercise for the elephants, pointing to a successful breeding program as proof that the animals are in great shape. Even so, if we were looking to do an extended stay at an elephant centre, we’d opt for Elephant’s World in Kanchanaburi or Chiang Mai’s Elephant Nature Park, both of which have larger forested properties and excellent reputations. Check out the Elephant Stay website for details if you’re considering a stay at the Kraal. The Royal Elephant Kraal is located a couple of km north of the island’s northeastern corner. Take one of two bridges crossing the Mueang Canal from the Hua Ro Market area and keep right, passing Wat Chedi Daeng on the way to the Elephant Kraal. You’ve almost arrived when you reach four life-size war elephant statues.